We are always interested in new endorsers at B-stick. You don’t have to be Steve Gadd – we appreciate hard working drummers. Please, PLEASE read ALL info before you contact us. Then, if you still have questions, feel free to ask. FIRST ENDORSEMENT ORDER MUST BE MINIMUM 30 SETS. Want to be an ambassador for B-Sticks and get endorsement benefits? Most of our endorsements are in the 25-40% range and mostly depend on gigging schedules. Please review the prices before you contact us. 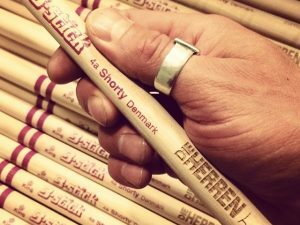 In some countries sticks are very cheap and even with Endorsement Discount, some get disappointed. Remember that in Denmark we pay 25% in sales tax and the law requires us to list the prices with the tax included. The tax does not apply outside EU, but goods are subject to your country’s rules on import tax and duty. Countries outside EU do NOT pay the Danish sales tax but you are responsible for paying your country’s sales tax and duty – if any. We then suggest a discount % and if we agree we update your profile on the site and your personal prices will now be reflected when you log in. PLEASE NOTE: Minimum first endorsement order is 30 sets. You place your order and pay through PayPal. If you do not have a credit card then please look for our bank information under ‘Contact Us‘ and initiate a bank transfer. Your first order will ship with stickers etc. You send us pictures of you with the sticks and stickers on your drum set.